Looking for an easy stitch with texture? The Seed Stitch is it. 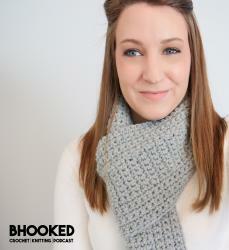 In this episode of B.hooked Knitting, I’ll teach you how to knit the the seed stitch. This stitch is the perfect next step for beginner knitters who’ve mastered the garter stitch and the stockinette stitch and are looking for something new. The seed stitch is a very popular knit stitch and is used where ever texture is needed. It’s perfect for so many projects: scarves, hats, garments…you name it, the seed stitch will bring rich texture to it. It has a reversible nature (it looks the same on both sides) and it curls much less than most knit stitches. Now with that out of the way, the seed stitch will allow you to practice your knitting and purling skills. This beautiful stitch is the result of knitting the purls and purling the knits. It creates a nice dense fabric with a lot of stretch. Depending on the yarn and needle sized used, you can do so many things with the seed stitch. I don’t want to throw too much at you at once so for now just realize that purls are the opposite of knits – meaning that when you flip your work, your knits will be purls. This doesn’t happen when we knit in the round because we never turn our work. So when you get to the beginning of the next round, take a minute to observe whether it is a knit or a purl and follow our simple rule of thumb for the seed stitch: knit the purls and purl the knits. The seed stitch is perfect for reviewing your skills of “reading your knitting” and recognizing knits and purls as they are on your needles. In this tutorial, we’re going to work up a test swatch. You will only need 15-20 yards of yarn to get the hang of it. Any yarn in your stash will do and a pair of coordinating knitting needles. Row 1: k first stitch, p next. *K, P. Rep from * to end of row. Row 2: p first stitch, k next. *P, K. Rep from * to end of row.